Springfield, IL Walmart Bans Trucks Entirely After City Issues $50k In Fines! Rocky Mount NC has banned vehicles over 25' or over 10000lbs from parking within city limits. Even on your own property. Several Walmarts ive spoken to have stated that they have no problem with trucks parking. Drivers usually buy lots of supplies and are good customers. But the towns will come in and ticket or boot the trucks based on town ordnances. Their attitude is simply, "Bring me my stuff, then GTFO." I'll now be reading this one. 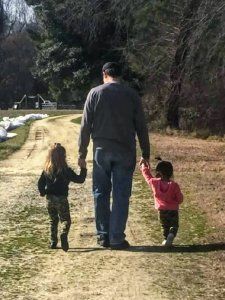 I love my OTR position, but it's not working out so well for my wife and little girls. 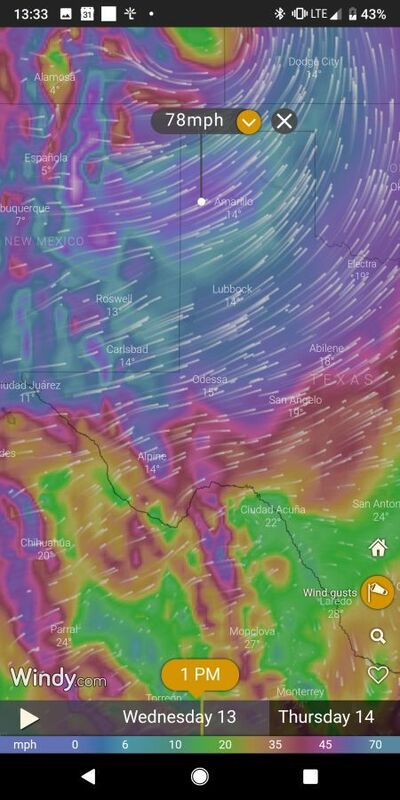 May be looking into this path. I liked 6stringrhythms diary about going into LTL. It's what led me to this community. I just dont have time at the moment to hunt it down. It's actually more than just rpm and mph. In a car the transmission is synchronized. If you choose the wrong gear you may cause the car to bog down or over rev, but it will go into gear. These trucks use unsynchronized transmissions. The driver must manually match engine, transmission, and wheel speeds. If they aren't in sync, it won't go into gear. You can measure engine speed with your tachometer, and wheel speed with your speedometer, but you have no means to measure transmission speed. This is why you double clutch. As you press the clutch and pull stick out of gear you disengage the engine from the transmission, and the transmission from the wheels. All 3 components then start losing speed at their own pace, getting further out of sync. You can still control engine speed with your throttel, but you have no control or measure of transmission speed. To fix this once we pull the transmission out of gear, we release the clutch to reengage it with the engine. Now that the engine and transmission are connected you can apply throttle to spin up both the engine and transmission in sync to your required rpm. Now that everything is in alignment you briefly press the clutch again and push the stick into next gear to connect engine/transmission with the wheels. Take care not to hold the clutch in to long, or the transmission will again lose speed and be out of sync. The Knowledge that 801052 is out there, stalkng it's next victim. The Fear that if I rest for to long, 801052 will catch me. Sometimes at night I wake in a panic and check the GPS tracker, just to be sure I have enough distance to comfortably rest. Back in June I was delivering a produce load to the Walmart DC in Brundidge AL. They only had a few doors for unloading produce and basically left it up to the driver's to form a line and back into an available door when a trailer was pulled. This location also had you drop your trailer in the door and then go park in separate bobtail parking area. I had helped out a driver who was lost in the chaos of the place and spent a short time joking around with him. Eventually I had gotten my trailer into a door and relocated to the bobtail area. A little while later that driver came and knocked on my door, "hey wasnt that your trailer in the 3rd door?? Another Prime just pulled it out!. So I jump out and go check..... My trailer is gone. I run inside to the office and ask the ladies inside. They ask on their radios and someone reports that no one should have pulled that trailer, it hasn't been unloaded yet. Now everyone in the office starts freaking out. They ask me to please go looking for it while they contact the police and report it. I return to my tractor and start driving around the yard. I spot a Prime truck/trailer with it's doors open along the curb heading out towards the exit. I get closer and I immediately recognize the load from when I put up my load locks, that's my load! I pull up next to the driver's window. "Hey man how ya doing, where ya headed with that trailer???" He responds "oh im just heading to a truck stop, I dont have a load yet." Then I reply, "You know that trailer is loaded right???". (blank stare from him) "that's my loaded trailer you just pulled out of that door!" (His face turns to a pale white). "Did ya happen to look inside?" He jumps out and runs to the back to look inside... "Oh sh**!!" So anyway I got my trailer back. I lost my spot at the dock but Walmart pulled another trailer specifically for me so they could resume the unload. I ran into two other Prime driver's who had gotten pulled over and questioned by the police during this time. Walmart had indeed reported the load as hijacked and the police were checking all Prime vehicles. A fiasco that could have been easily avoided if one driver had just been paying attention. He didn't check the trailer number, nor did he verify that the trailer was unloaded. He just saw a Prime trailer in the approximate location he left his trailer and assumed it was his. 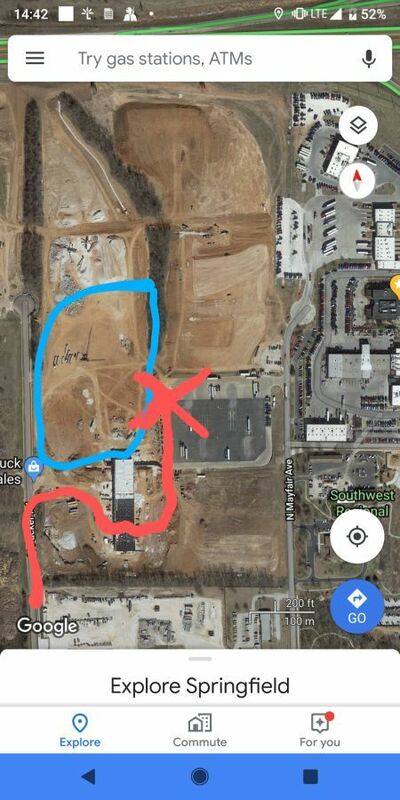 Lol i tried to use the red line and X to indicate that you came through Plaza building inbound and turned left past the practice pad. Lil difficult when the road you were on didn't exist in that imagery. Blue circle is the pad you took the photo of. This was my current load before I had it reworked. Picked it up in a pitch black dirt drop lot and did my best to balance it legally, before scaling it. Was very happy with my balancing, not so much the legally part tho. That satellite imagery is old and the pad you took a pic of is a dirt lot in this imagery. But that's where you were! Still got the rubber side down! I guess I kinda got lucky. The other driver dropped his loaded trailer at the TA in Vegas and left. Once I found the trailer and hooked up to it I noticed my right weigh gauge was showing the drive axle overweight. 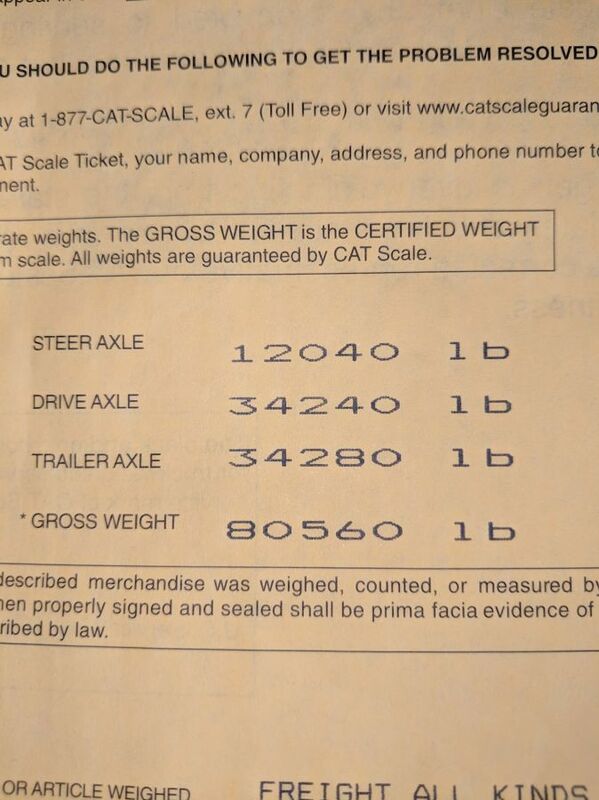 I made sure the axels were all the way forward and dragged it over to the cat scale. 35540 on the drives with the TRL axles all the way forward. Once I told dispatch my problem they contacted the other driver and made him come back and take his trailer back. So I'm currently unloading in Henderson NV and my fleet manager needs me to immediately after my unload go repower a load out of Vegas that delivers tomorrow morning in Denver. 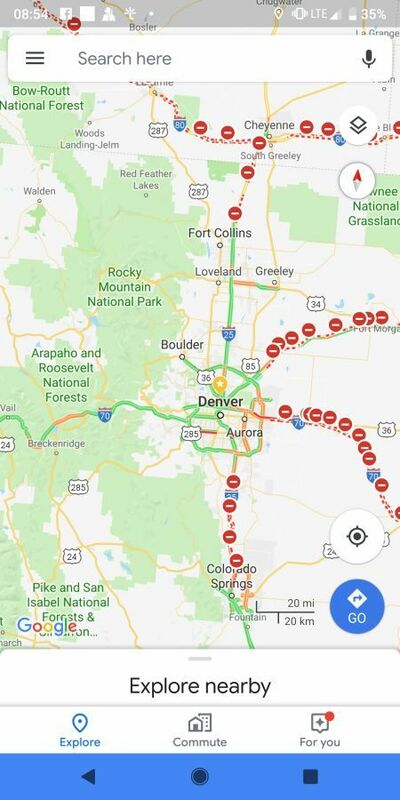 I just drove 200+ extra miles just to avoid the mess that is Denver right now and not have to go over Vail Pass. Be careful out there all. Lots of CB chatter about truck rollovers. Probably a good day to park it. Isn't it on the floor between the driver's seat and the door? So I just had a guy next to me knock on my door. Period. Now I practically need to hear the relaxing symphony of diesel engines or I can't sleep. Seriously if my reefer or apu aren't running I have a hard time falling asleep! That's the load I'm on now. Picked up @ ben&jerrys in VT and going to Henderson NV. Unfortunately this trailer I picked up also has problems. I just rolled into the Springfield terminal to get it repaired. I didn't even know you were there. My trainer and I stayed the night for a p/u next day in Allentown, PA. Our first 01, last week, was for Ben & Jerry's (90 was in Henderson, NV). 01 was good...no wait plus free pints of ice cream!!! This YouTube video describes that which Turtle speaks of. Youz guyz are so organized!! mine are all over but the same. You see, that's the difference between men and women. Men need to compartmentalize things. A man's brain is like a box, and within that box are other individual boxes. Each box contains a single object, idea, thought, emotion, etc. When a man needs to use his brain, he goes to the box he needs at that moment, and opens it. When he needs something else, he must first close the first box before opening the next. He's incapable of opening two boxes at once. Therein lies the reason for having the apps all in one place. 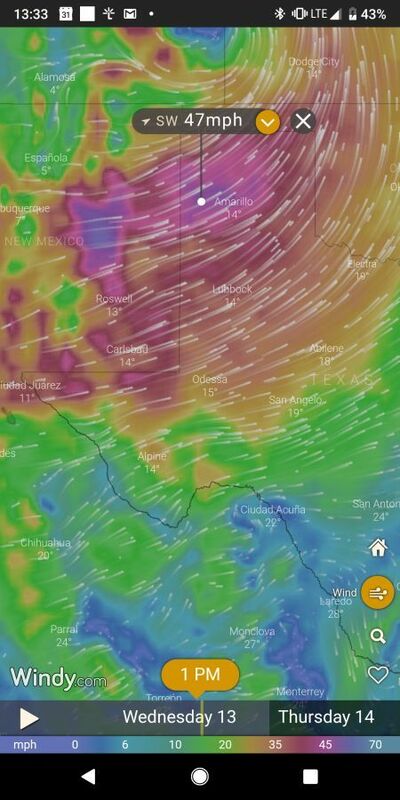 We will likely lose our place going from one app to the next. A woman's brain however, it's like a fuse box. On the surface it appears neat and tidy. But behind the panel is an unorganized jumbled mess with wires going every whichaway. But when her synapses start firing she can tap into every one of them wires at once, accomplishing the task at hand as well as several others at the same time. The fact that her apps are scattered all over the place has no bearing. She is truly a well-organized symphony at which to marvel. 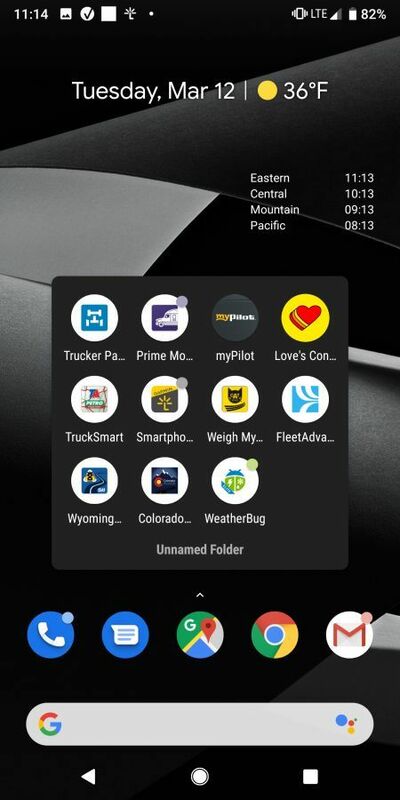 By the time I get my trucker path app opened, she's probably already found and opened the app, noted the background color, saw that she has two new e-mails, formulated a reply to said emails, trip planned her 30, fluffed her pillow, and petted the cat. Ah no kidding. I just looked at when you posted this and realised I was in Pittston at the same time. Was omw from MA to VT but my reefer threw am alarm. Had to drag it back down to Pittston for repair before heading back up to VT for a Ben&Jerry's load. School or company paid training? Exact same situation I was in. I was originally going to attend a CDL school at my local county college while working a full time day job. I am very glad I decided against that option. After laying out the money for CDL school you are at the end left with a CDL, but no job and no experience. You'll probably end up applying to one of the larger carriers that would have trained you for free anyway. The fact that my wife and kids were depending on me to keep the mortgage paid and get money coming in to put food on the table was a great motivator for me to buckle down and compete my CDL training. Then once I had my CDL I already had a job and immediately began my paid on the job training. The $250 bonus Prime paid me for passing my CDL test on first attempt was also nice! 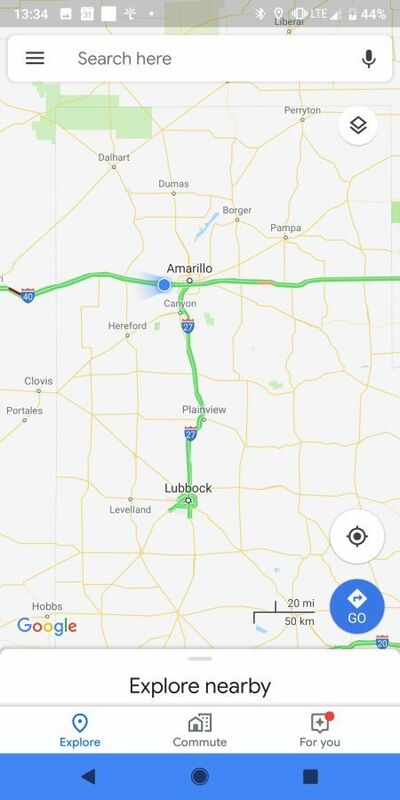 Having instant direct communication between driver and dispatch has created a very different industry than how my father described his trucking days.